Each year I like to attend three or four Berliner Philharmoniker concerts which I consider as the Rolls Royce of world orchestras. 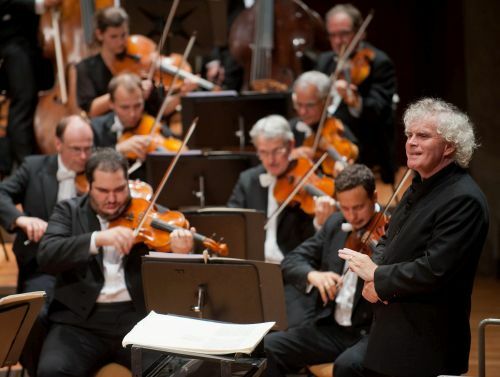 After twelve years the endless carping about Sir Simon Rattle’s relationship with the Berlin players has become exceedingly tiresome and yet still it continues. I had a much admired friend, now deceased, who often used to say “if you don’t believe what you hear then believe what you see.” What I saw in Berlin for these two concerts, comprising the first two of the complete set of the Schumann and Brahms symphonies, was an orchestra at the height of its talents conducted by Sir Simon who facilitates performances of unyielding musical passion. Contrary to what we often hear and read in the press, the relationship between players and conductor looks like a decidedly cordial one and when after a concert Sir Simon moves into the body of the orchestra to congratulate all sections and individual players the mutual gratitude feels unerringly sincere. I sense that the penny has dropped with the Berlin audience that Sir Simon will be leaving in just a few seasons leaving many anxiously wondering who the new principal conductor will be and when the announcement will finally be made. What I heard at this pair of concerts was such glorious music making on an elevated level in repertoire, played unstintingly by this orchestra since its foundation in 1882, which runs through the orchestra like lifeblood. The Berliner Philharmoniker has recently released a set of live recordings from 2013 of Schumann symphonies – the inaugural issue on their own label. I was one of the first to review this set and wrote “I can see these Rattle recordings of the Schumann symphonies becoming the benchmark for many years to come”. In the Schumann performances, as with the recordings, I felt the solidity of the playing. Everything felt natural and unmannered with Rattle choosing judicious pacing throughout that enabled him to communicate a spring-like freshness to Schumann’s romantic vision. So very characteristic of the work this orchestra undertakes everything was done with integrity and precision conveying a sense of total empathy for the music. In the B flat major ‘Spring’ Symphony impressive was the intimate yearning of the Larghetto where Rattle brought out the romantic character and soul of the music. My highlight of the C major symphony was the rhythmic Scherzo, so Mendelssohnian in spirit, given such fresh, highly focused playing with the development towards the climax of the movement sounding especially taut. Glories of late-romantic music, the Brahms symphonies are undoubtedly music that lies right at the very heart of the tradition of the Berliner Philharmoniker and it felt like a special treat to experience two of them in performance. In the first three years of the orchestra’s history all the Brahms symphonies were played with the third being played a number of times. The Berliner Philharmoniker has recorded the Brahms symphonies numerous times under different conductors and where Herbert von Karajan was concerned several times under his baton. Sir Simon recorded these core works with this great orchestra in 2008 and I’m surprised it took six years of his tenure before he did. With each of the Brahms symphonies Sir Simon’s interpretations felt urgently spontaneous with playing that conveyed a late-romantic power of unfailing intensity. In the C minor score what sticks strongest in the mind is the grave and threatening timpani stokes that open the first movement and I fondly recall Albrecht Mayer’s beautiful oboe playing. Throughout this critical movement Sir Simon successfully provided liberal quantities of both beauty and menace. In the D major symphony once again it was the opening movement that made the greatest impression leaving a feeling of restrained joy with an undercurrent of dark foreboding. This dramatic music felt as if it had been hewn out of the granite of an Alpine peak tinged with a beautiful soft edge that evoked a picturesque Tyrolean scene of verdant pastures. Such was the level of the audience ovation at both these concerts that Sir Simon was called back to take a bow with the orchestra three or four times. Even though the orchestra had left the stage many of the audience continued to applaud for some minutes and Sir Simon came back on again to offer his own personal thanks to the audience. Mmm, so much for the continuing problems with the Berlin audience then.